Sure, the ink might be barely dry on Anglicanorum coetibus, but for the second time this year, a prelate of Canterbury's US arm was ordained to the Catholic priesthood on Wednesday in a quiet ceremony at a Florida retreat house. Now 59, Fr John Lipscomb led the Episcopal diocese of Southwest Florida from 1997 until resigning in 2007 to swim the Tiber. Saying that Catholicism's brought him "a fullness of life," the married father of two has been assigned as spiritual director at the diocese of St Petersburg's Bethany Retreat Center, where Miami Archbishop John Favalora led the ordination in light of St Pete Bishop Robert Lynch's continuing recovery from a summertime cancer scare. Lynch, however, was able to make the liturgy, which he preached. 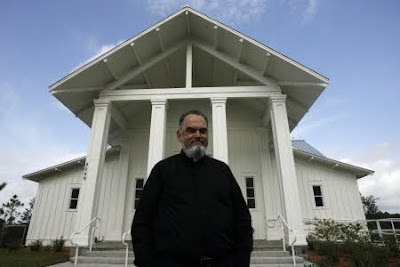 Lipscomb became the 100th priest ordained for the Gulfside diocese since its founding in 1968. Likewise present in the sanctuary at Wednesday's rites was the first Episcopal bishop to travel the path to Rome: now Fr Jeffrey Steenson, the former head of New Mexico's Rio Grande diocese, who was ordained to the Catholic priesthood in February.